The metal is from the old nightstore heater and a bit thin at 0.8mm. I cut out a rectangle for each side and marked out some fold lines etc. 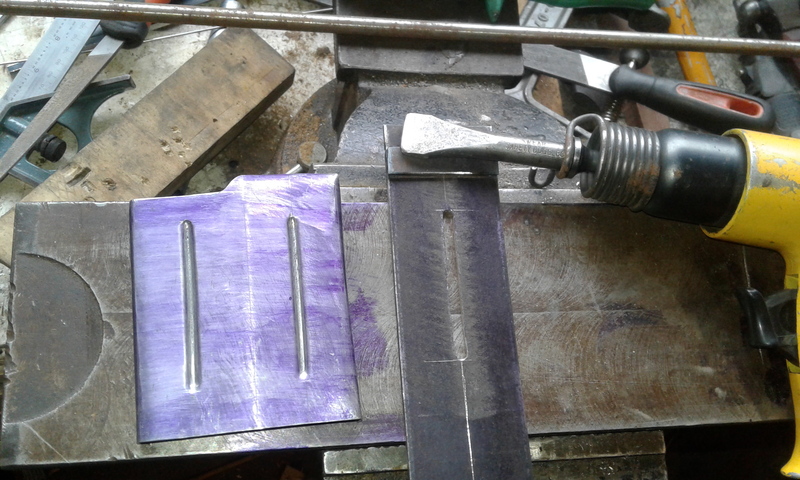 To put the stiffening ribs in I cut a slot in a piece of 3mm flat and used a modified chisel in an air chisel (the first go just cut through). 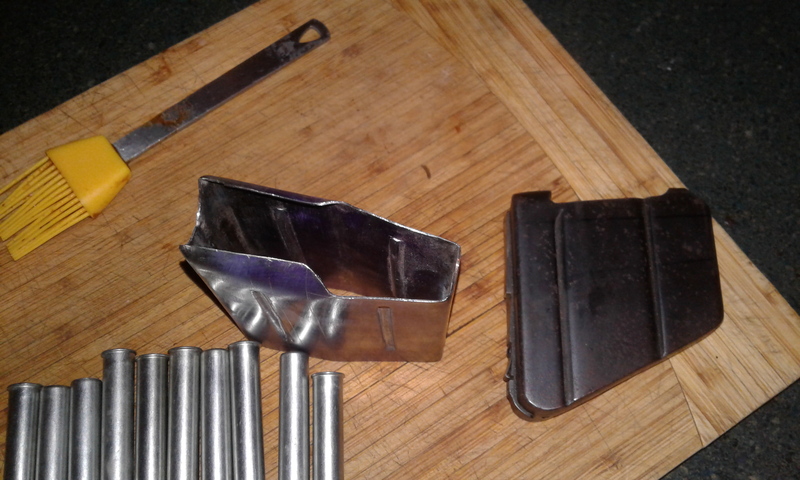 Then I just bent each shell and welded them together. veitnamcam, Bernie, nevereadyfreddy and 2 others like this. Smart but I like your 410 cases best! Maybe... keep your double stack magazine, but make it SINGLE FEED (like a sten gun magazine). Easier to get to work overall, and with single feed lips you can then have the top cartridge riding considerably higher, giving it a better chance to chamber. You could even design the magazine with the feed lips slanted upwards at a few degrees, for that extra chance of chambering, which will also help further to avoid rimlock, as per a standard .303 magazine. Anyway, with single feed magazine lips you would not encounter much rimlock. Another note on how to make a good follower. As I recall, PA Luty advises to use a longtitudinally sectioned cartridge as the ideal shape to construct your magazine follower. 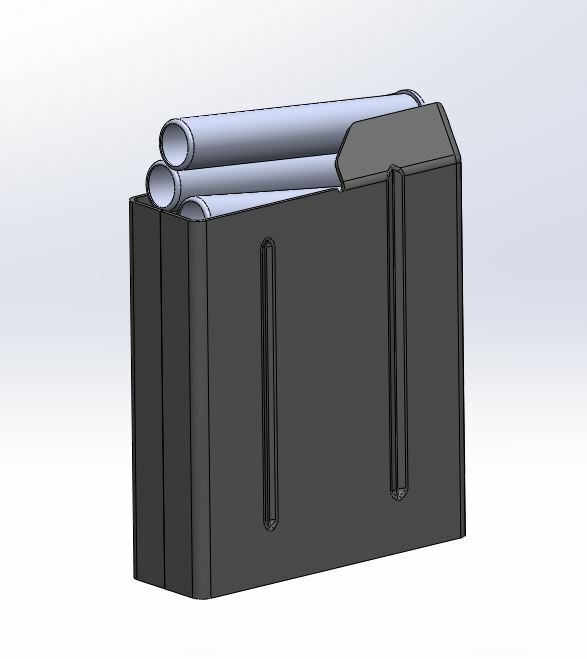 If you go with the double stack + single feed idea, place the half cartridge centrally on the follower to enable it to support the final cartridge as it is held by the magazine lips. It will then also function as a bolt stop on an empty magazine, an improvement on the Lee Enfield! Last edited by Cordite; 25-02-2018 at 10:26 PM. Barefoot, mikee and Tommy like this. Slept on it. Why not just alter the existing magazine to single feed? There is a lot of good engineering in it that you just won't waste, and it will mainly involve some brass soldering, but you may of course not get as many rounds into it. Blu tack on centre line of .303 magazine mag follower, stick a 410G shell on top centrally, try chambering it with the bolt. Once you get the correct height you know where to solder on the lips. Alternatively, looking at the Sterling SMG mag above, you can straigthen the current feed lips on the SMLE mag and add a pair of double feed lips that have the top round riding significantly higher than with a current SMLE mag. 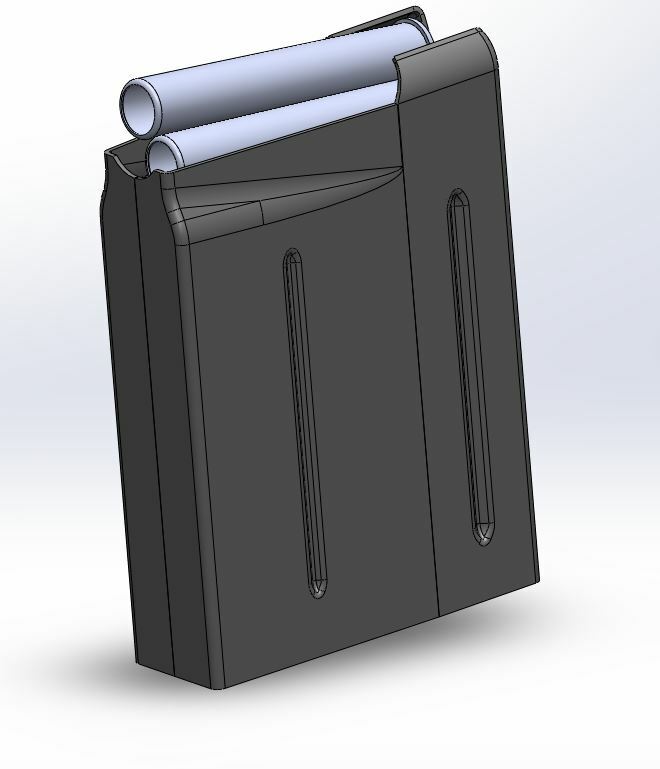 Would save you interfering with the magazine follower (though it would now still become a bolt stop when mag empty) .... and this might even give you an extra round magazine capacity, to offset any capacity lost by using the original mag! Last edited by Cordite; 26-02-2018 at 10:15 AM. Keep at it! It is looking good. You have discovered one of the often overlooked facets of good firearm design. 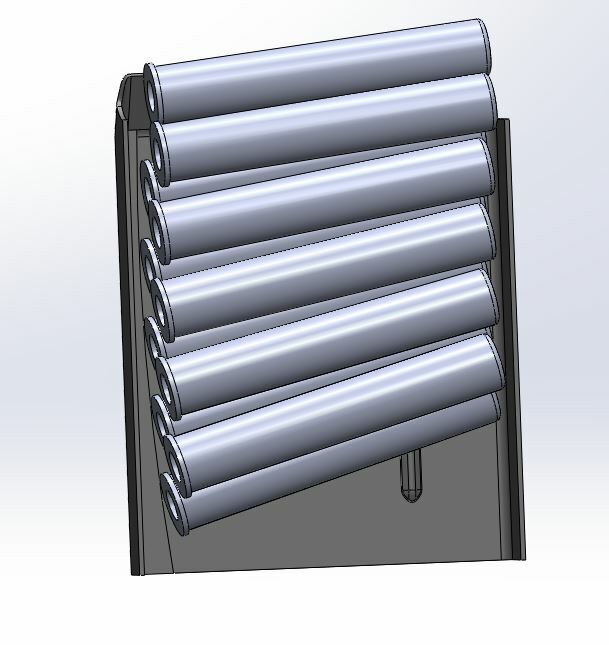 The humble and simple-looking successful sheet-steel magazine is actually a very tricky item to design and manufacture, not only in the design but also in the grade of steel that can be readily formed but still keep strength in the thin feed lips. I would concur that you will get much better results with a double-stack/single-feed system, as the blunt nose of the .410 cartridge will present real problems otherwise. I wrote a post this morning but it didnt work. Anyway the one I made was supposed to be a full double stack just to see if I could make one, there is no way it would fit in an Enfield, in some ways this was a success even though I marked it out and folded it wrong, and then forgot I was making it wider at the front (as opposed to the narrow front end of 303 mag). The idea is to make it kind of 1.5 stack at the top (which is essentially the 303 mag without the forward lips) which will be the same profile as the Enfield mag and taper out to a double stack before it comes out of the trigger plate (which will need modifying), I will make the feed lips longer (front to back) although this will require reliving the receiver a little bit, the only real reason for doing this is so a charger clip would work so it is really only for coolness if it works. If this doesnt work the feed lips can be extended to make it a single at the top. The original mag could possibly be modified to a single stack but would only hold 3-4 rnds and would need to be squared off on the bottom other wise the follower would jam up. I recall one Indian arsenal made a modification to the Sten Gun mag that virtually resolved jams in return for reduced capacity. They soldered a pair of brass welding rods along the magazine side walls, making it narrower, so the double stacking was steeper (? ?to the point of becoming single stack, not sure of that one). A SMLE mag could be modified in similar way, only to the point of making the stacking steeper (not quite single stack) and thus allowing use of the narrow-front mag. I notice your CAD drawing does not make any allowance for correct rim stacking and the consequent forward curvature of magazine to allow for it. You will also need to incorporate a guide rib that follows the rear curvature of the mag to keep the rims 'on track' (as per Bren mags) to prevent rim locking. The follower also needs to be designed to keep even pressure on both the front and rear of the cartridges throughout its travel. If this does not happen then you will get 'nose dive' when the feeding pressure is exerted on the rim as the bolt closes. People and companies have been trying to make a double stack shotshell mag that actualy works reliably for years now. If there was such a thing out there then you would see it being used by the gaming crowd. As has been pointed out already there are some quirks involved when making these things feed from a box. Get your hands on a saiga/vepr 12 mag and take a look at how the guides in the mag help to line up the shells. Mossberg have come out with a double stack box fed 590 this year so we will have to see how that one progresses. Good luck in your endevour, you may become a wealthy man if you succeed! Last edited by Towely; 27-02-2018 at 11:07 AM. 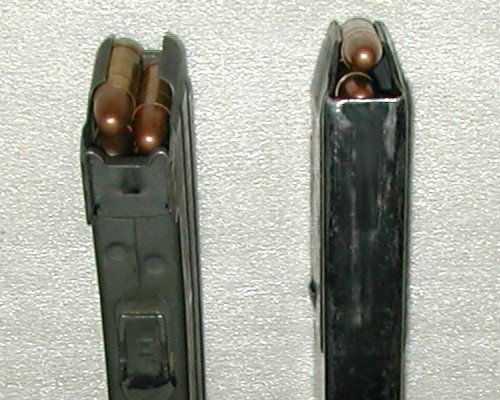 The Saiga mag is to prevent rimlock occurring. The original specification for the .303 cartridge has a 45deg chamfer at the rear edge of the rims to avoid this problem. However, much .303 ammo does not have this rim chamfer, simply because the SMLE magazine is designed to avoid rimlock - by tilting the rear end of cartridges increasingly downwards as they go down in the magazine, almost as if sliding back off the magazine follower -- hence the rear-down shape of the SMLE magazine. Bloke On The Range has an interesting YouTube video on Rim Jam, why it is not a problem. Saying that, I have put a lot of cases through the lathe to do a quick chamfer. Last edited by Cordite; 27-02-2018 at 01:27 PM. Hmmm maybe I should have asked google before I started, I didnt realise it was considered so hard to do! 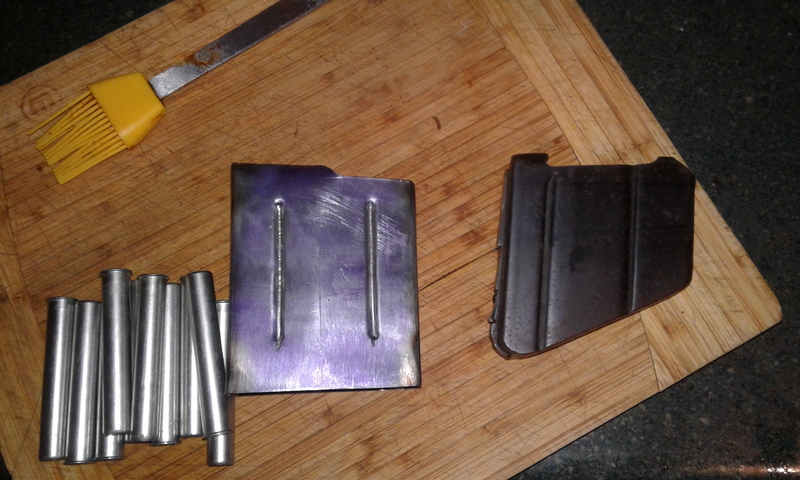 Anyway after playing with the body I made and a Mauser follower and spring (cause its all I have) and reading Gundocs post the body I made cant work, infact the front of the mag actually needs to be wider than the back to get the rims in the right angle to each other because there is no case taper to help. The ribs down the Enfield mag are in very deliberate positions.... The front rib holds the cartridge back on by the shoulder. That Said I dont think it is impossible or even too hard to prevent rim lock, especially with the 410 as opposed to a 12g. 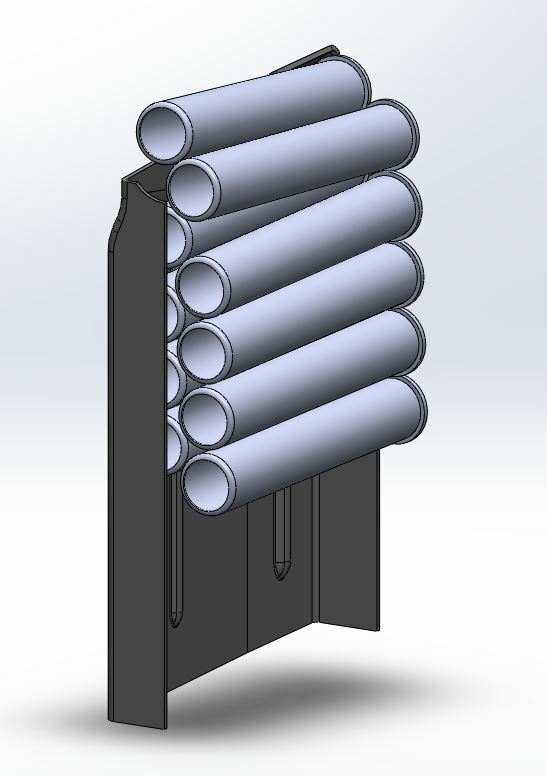 The mag will have to have single feed lips as high as possible though, the 410 has no taper or point to help it align with the chamber so it will need to be as close as possible to the correct orientation. A brass welding rod down left and right, riding atop the rear inside ridges of SMLE mag, and your SMLE mag effectively has rectangular geometry - and with sideways allowance for the extra width of the shotshell rims. It would still allow a (steep) double stack, but <10 rounds and double feed to use stripper clips. Whatever feed lips you then create, single or double, can then also be narrower too with no filing of the SMLE itself required. It might work but it would only be single stack and the lips would need extending (and I only have one magazine and that goes with a gun that still works) the front is too narrow for the 410 to be anything other than single stack. The rim of the 410 is the same as the 303 so the back end isnt really a problem.